About Parish Records - What are they? Parish Records are records of baptisms, marriages, and burials made by the Church. They are a valuable resource for researching your family tree because the census and official records of birth, marriage and death do not go back further than 1837 - Parish records can extend your research back to the time of King Henry VIII. 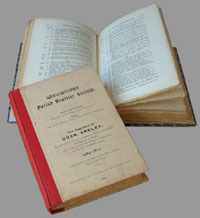 Phillimore Parish Records is a series of books published in the late 19th and early 20th centuries, and hold transcriptions of marriage registers. Learn more about W.P. Phillimore here. The Phillimore transcripts of parish records go back as far as 1538 for some. W.P. Phillimore was a genealogist who started the job of publishing transcripts of early parish records in the 1890's. These normally end in 1812 or 1837. For the range of years covered you will need to look at the details for the county you're researching.